I'm so happy to be on Steemit every monday since October 2018😊 because I will find so many interesting post on #fruitsandveggiesmonday which runs by @lenasveganliving (get well soon and thank you for keep sharing wonderful vegan recipe😉) and now host by @plantstoplanks on @vegansofsteemit😍. If you want to join us, make sure you read the rules on This Post. I Love glutonious or Sticky Rice so much 😊 I think I can live just with it for the rest of my life 😀 but, sticky rice has too much calories and sugar😊 which will make me easily develop a good realtionship with diabetes😁. 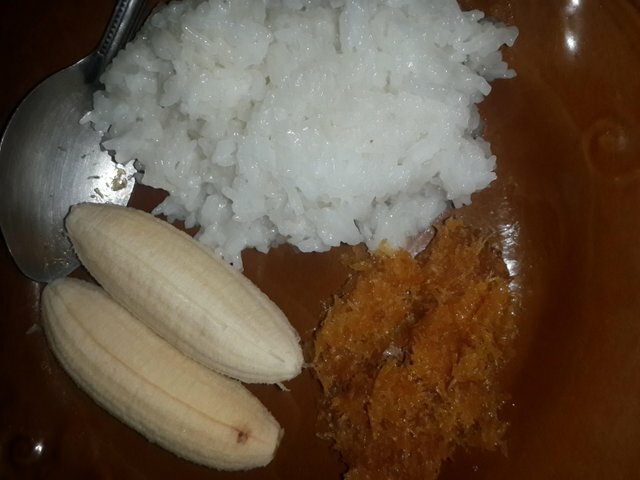 In my hometown, Aceh, to find sticky rice with sweetened coconuts, or fried banana or indinesian sushi aka Lemper as breakfast are not a challenging thing to do😊. 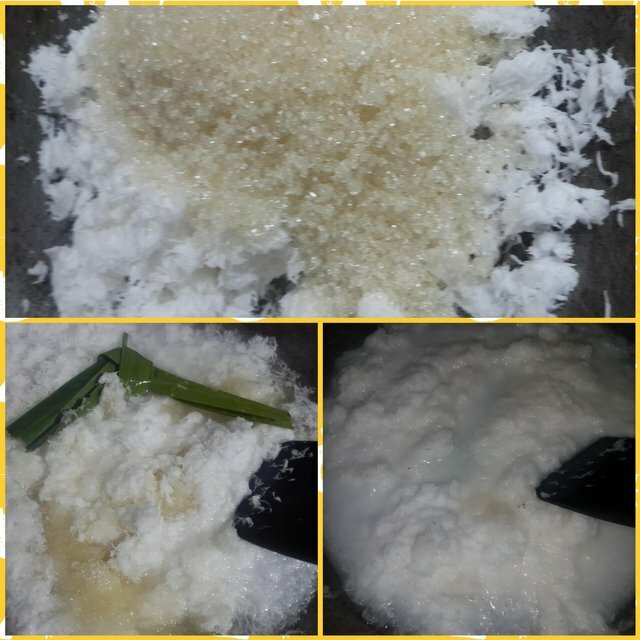 We could find in in form of Uli (sweet sticky rice) to eat with savoury tempe or grilled it in banana leaves too. 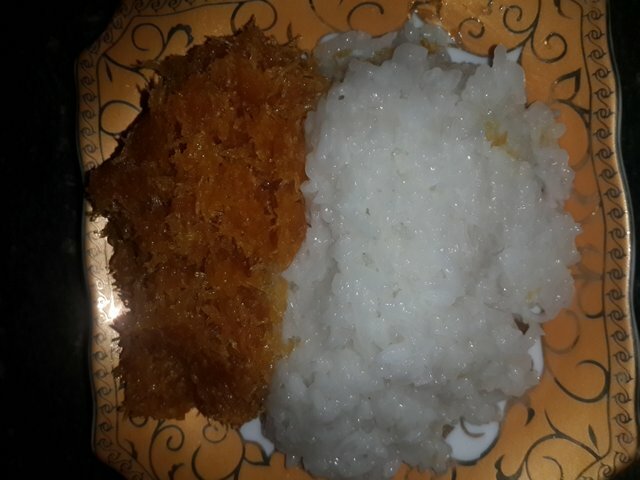 Uhmm.. since Rice is the common main food in Indonesia, we have it as breakfast or other meals. Why Not include it for FAVM? But it's not until 11.pm that day, when I remember I bought it😯 and if I didn't proceed it A.S.A.P, it would be such a waste😢. The only thing came into my mind only "sweetened coconut". Well.. you can make candy or other kind of sweet cake with it later, my mind told me😊. 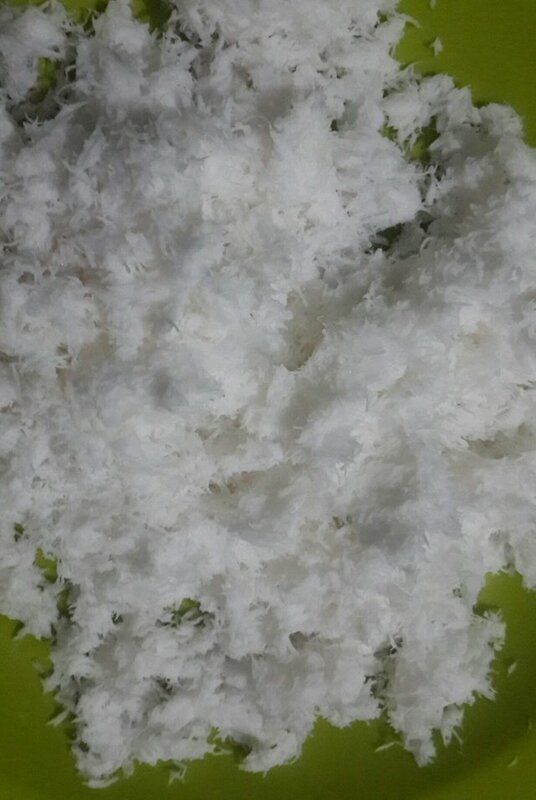 I got about 300 grams of not too fresh grated coconut, I add 50-100 grams sugar, a tea spoon salt, a piece of pandan leave, 150ml water and cook it on medium-low heat. You must stir it up continously (that's what My Mom said when I was a helper in her kitchen years ago😊), to ensure that all perfectly well cooked. 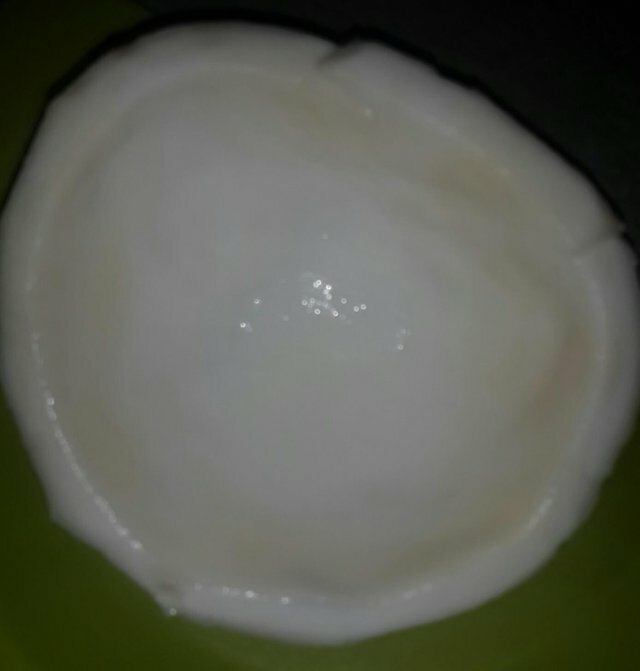 I need to make it a bit shiny😊, so I pour 25 ml sugar palm syrup when the water about to dry and mix it up, flip and stir till it well-cooked😊 taste it a bit, it must be soft and sweet now. I know that My FIL doesn't like too sweet food, so I gave him options😊 sweetened coconut or banana to eat with his sticky rice😊 If I have banana leaves, I will roll the banana in sticky rice, wrapped then bake it. This kind of food, if you have it as breakfast or dinner😉 will make you full and want a cup of black coffee to enjoy it😇. 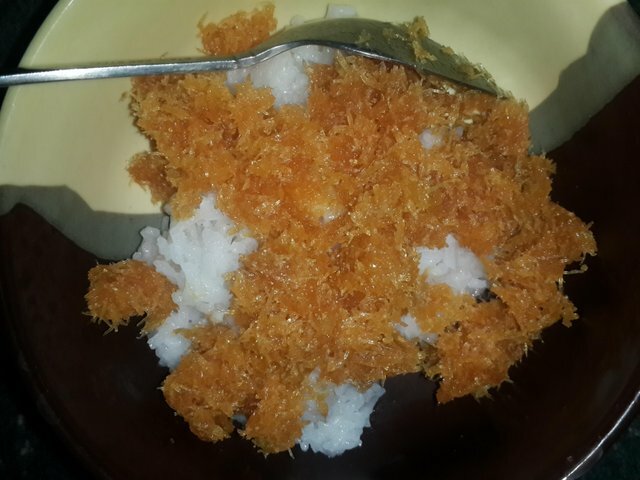 Anyway, even though sticky rice and sweetened coconut available as breakfast in many coffee shops in Aceh, this is also a special dish for some ceremonial celebrating events like wedding, baby shower, graduation and birthday too. Ahhh.. you can keep the left over sweetened coconut in the regrigerator too, you can sprinkle it on your toasted bread next day😉. hahaha, I think we are going to get really well together. *Sticky rice is Life! Lol.... we also cook it in coconut or we dip steamed sticky rice in grated young coconut. 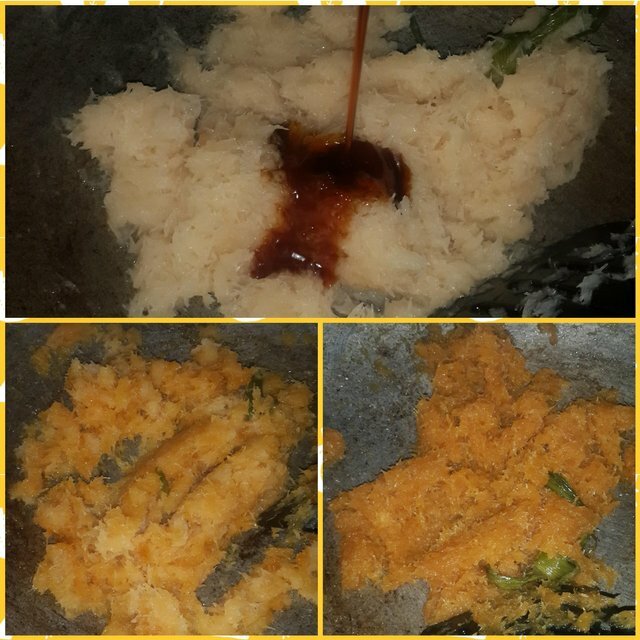 @cicisaja our sweets are very similar in terms of cooking, my favourite is Steamed sticky rice wrapped in banana leaves and dipped with a sugar palm sauce. I bet heavenly delicious @cicisaja! We're from the same cullinary culture roots @sherylneil 😉 oohh I miss you a lot. Been busy with myself lately and lost in my way to check on yours and other posts... 😊 how are you? Can you please come and visit me in Cairns? Anyway, its just 6 hours from Indonesia. Please cook these things here so I can enjoy them. Yes. Do have fun with your postman. I just love his reaction especially when I purposely pretend to take a "walk" after he leaves our house hahahahaha I wish I could read his mind. I hope that you get to enjoy whatever you're doing. hahahaha you should tell everyone you know to send you guys more mail. Where I am now, we have a lot of mails daily. I just cannot understand why they need to do it in one day. Why can't they come like every 2 days. SEriously, these guys must be tired of walking on the same route everyday. They walk? OMG... I never seen any postman walking while distribute the mails, I saw one with bicycle when I was a kid in late 70s, but then I saw them riding orange motorcycle and our home is the only house at the mango alley (our address) who regularly he stopped by at least once a week till the mobile phone exists.